Raising the fitness barre in San Diego. To grow clientele and increase sales. Create a customized deal campaign on Facebook for new and existing customers. It’s user friendly and keeps my fans interested in finding out the latest deals on my Facebook Page. How Did Pure Barre Do It? Pure Barre studios offer fitness classes designed to help women achieve a long and lean physique. By utilizing the ballet barre to perform small isometric movements set to motivational music, Pure Barre techniques help to burn fat and sculpt muscles in record-breaking time. Pure Barre’s goal was to expand their efforts on Facebook as a means to build awareness, grow clientele and ultimately boost sales. Pure Barre created a deal using Vionic Deal Maker. The campaign offered 30 days of unlimited yoga classes for new and existing students at $89. It ran for 62 days and was promoted strictly on Facebook with a $0 advertising budget. San Diego is one of the fittest cities in the nation, making it hard for workout regimens to stand out in the crowd. 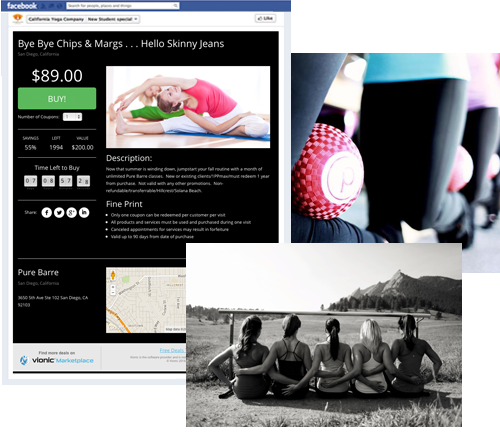 Vionic Deal Maker helped Pure Barre use social media to their advantage in order to attract new customers and increase sales in a competitive market.